Desarrollado sobre la base del SU-14. Se fabricó y probó un prototipo en 1936. En 1937 se canceló el proyecto al ser purgado su supervisor. El prototipo se envió a Kubinka para su almacenamiento. En 1941, durante la Batalla de Moscú, se usó el SU-14-1 para realizar bombardeos a larga distancia. The SU-14-1 is considered more dangerous than the S-51 because some players in the S-51 (which unlocks from the KV-2) may not have played any of the earlier artillery, and thus are inexperienced. Very high damage with 203mm mortar. Better power to weight ratio than the S-51. Horrifying aim time, but no worse than the two previous Soviet SPGs. Has SU-8's top gun as stock. The 203mm B-4 gun is more accurate when mounted on this artillery than on the contemporary Soviet artillery, the S-51. Only the 12RT Radio carries over from the SU-8. Mount this immediately. 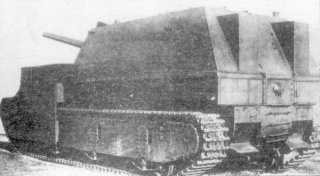 First, research the SU-14-1 Suspension. You have an option to research the 152 mm BR-2 and 203 mm B-4 first although you will not be able to use any equipment over 83 kgs while the 152mm BR-2 is mounted due to weight constraints. 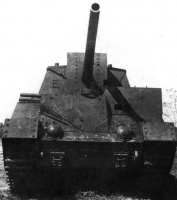 If the suspension has been researched first, research the 152 mm BR-2 followed by the M-17F engine as this will give you a bit more mobility for reasonably little XP. 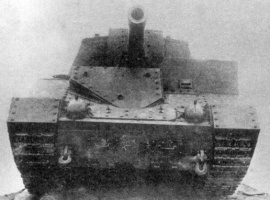 Finally, research the 203 mm B-4.